Chocolate cake with absolutely no flour. 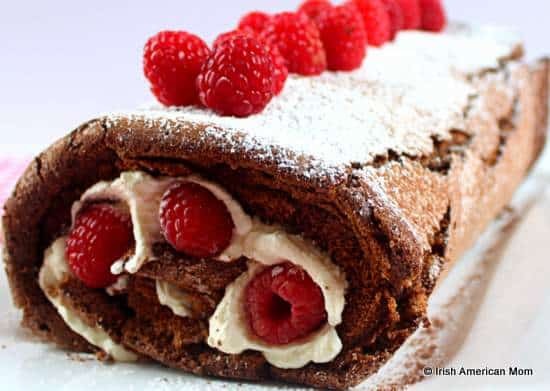 This delicious chocolate roulade is a gluten free treat, and a favorite dessert in Ireland and the United Kingdom. I know many may think a roulade is just too difficult to make. The thought of rolling a cake without letting it crumble into pieces is enough to make some cooks run a mile. But trust me. This cake is not as difficult as it looks. And if it cracks? So, what! That just adds to its charm. 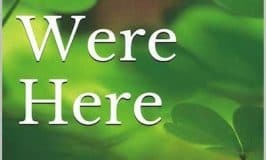 At least that’s what I tell myself every time my rolling technique fails me. 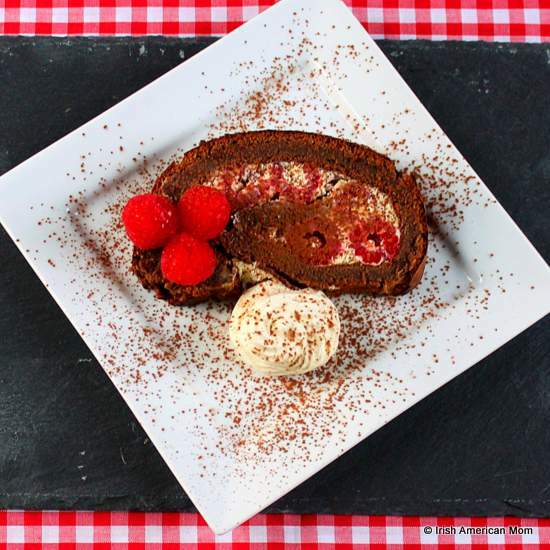 But luckily for this food photo shoot, I managed to create a pretty good chocolate roll. There are a few cracks on the surface, but when dusted with confectioner’s sugar and cocoa powder, this chocolate log looks just fine. 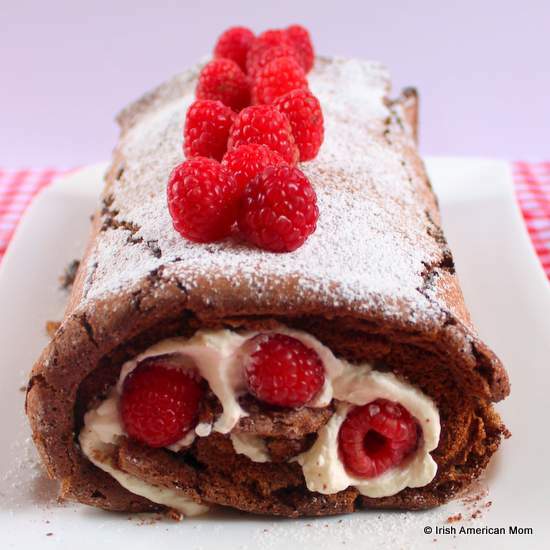 And for anyone searching for a special cake to cook for mom as a Mother’s Day treat, this chocolate roulade should seriously be considered. For any mom’s who avoid gluten in their diet, this recipe only uses eggs, sugar, chocolate and cocoa powder in the light sponge roll, making it a go-to gluten free cake recipe. This cake has always been one of my mother’s favorites, so I thought it would be the perfect recipe to share this Mother’s Day weekend. For years I only used four eggs and a 1/2 cup of sugar to make my roulades. I didn’t add any cocoa powder to the batter, and the end result was more meringue like than spongy. It was only when I read Mary Berry’s chocolate roulade recipe that I started to add cocoa powder. I add a little less cocoa powder than she calls for in her recipe since I’m not a dark chocolate fan. I started using six eggs just like she recommends and my roulades seem to be a success every time. Thanks Mary Berry for all your great baking tips. 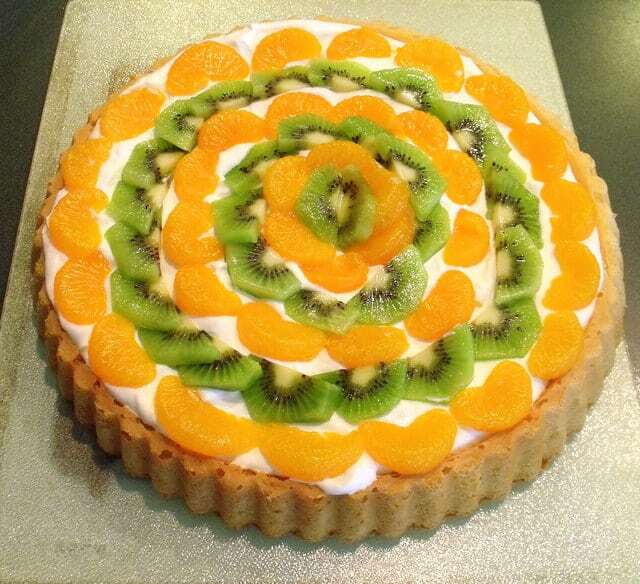 You can check out Mary Berry’s recipe and instructions here. 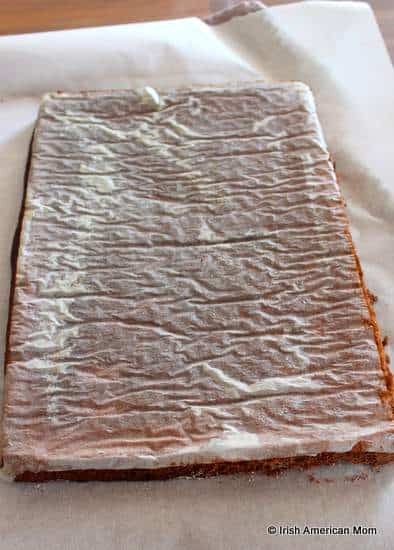 I don’t always cool my roulade over night and, unlike Mary Berry, I still use the traditional cooling method of placing a damp towel over the cake. 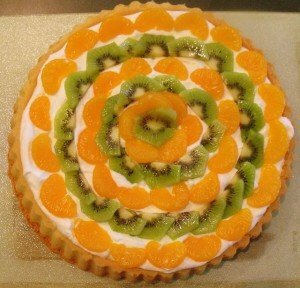 Here’s how I make this lovely dessert. The ingredients are ever so simple. Not even a sprinkling of flour is needed. Some bakers don’t use any cocoa powder in the cake, but I like the consistency of the sponge when just a tablespoon of cocoa powder is gently folded into the batter. Here’s a photo and a list of the ingredients. Don’t be intimidated by this recipe which is simpler than it appears. Here are my step-by-step photographic instructions so you will see how the ingredients transform at each stage of the preparation and baking process. 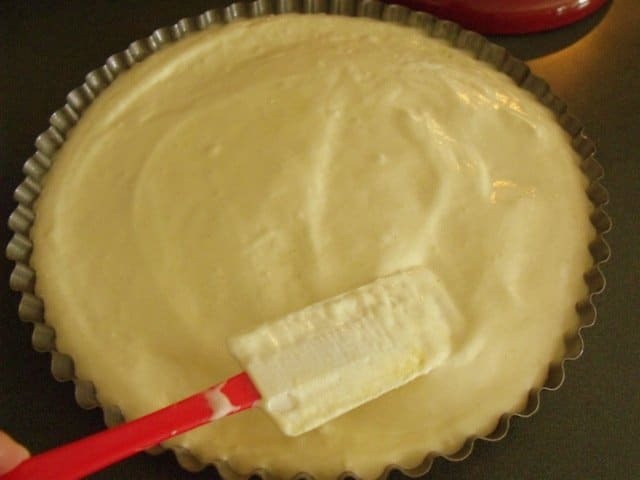 Before you get started creating the batter, prepare the baking tray. Once the batter is whipped it’s important to work at speed to get it into the hot oven quickly. So having the baking tray ready to go is all important. This recipe calls for a 13 inch by 9 inch baking tray (33 cm x 23 cm). Cover the bottom of the tray with parchment paper. I use a little butter to grease the pan first, then I place the parchment paper on the butter to hold it in place. I also rub a little butter onto the top surface of the parchment paper to make sure it lifts off the cooked cake very easily. If you wish to make this cake completely butter free, then skip the grease on top of the parchment paper. Pre-heat the oven to 350° Fahrenheit. Next add the chocolate chips to a heat proof bowl over a water bath in a saucepan. Simmer over medium heat. Don’t let the base of the bowl touch the water. 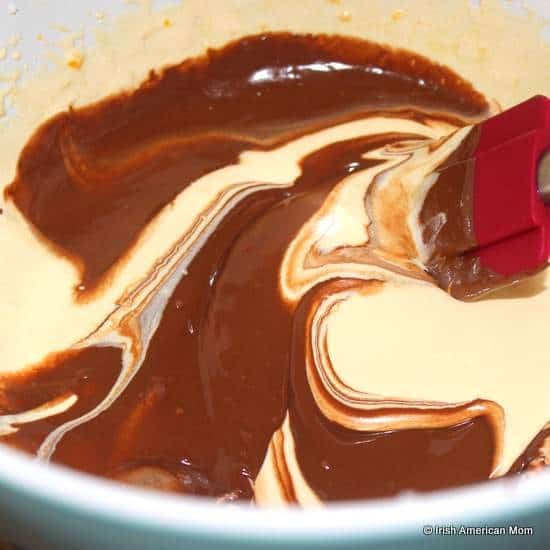 When the chocolate is melted, carefully lift the bowl out of the saucepan, protecting your hands from the hot steam with oven gloves or a dish towel. Put the chocolate to the side to allow it to cool, but not harden, while you whip the eggs. I know I’ve cheated – my bowl shows melted milk chocolate, but you can use chocolate as dark as you wish. You see, I’m not a fan of dark chocolate and neither is anyone in my family. So if I had used dark chocolate for our roulade, then nobody would eat it. With milk chocolate my crew can’t get enough of this cake. Next you need to separate the eggs, putting the six yolks in one bowl, and the whites all together in another large bowl. First beat the egg whites until they are stiff and glossy. Don’t beat them until they look dry. Remember they are done when you can hold the bowl upside down and the eggs don’t fall out. Next add the sugar to the egg yolks and beat until they are a pale cream color and the beaters leave a trail through the mixture. There’s no need to wash the metal beaters after using them to whip the egg whites. A little egg white is fine in the yolks, but a little yolk in the whites is not alright. That’s why I always prepare the egg whites first, and eliminate the need to wash the beaters. 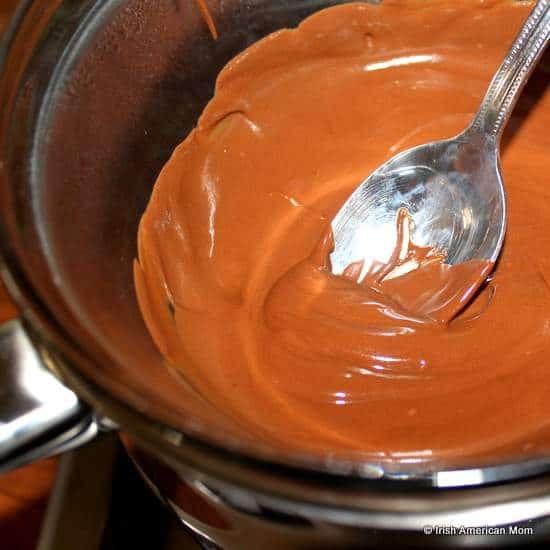 Add the cooled, melted chocolate to the egg yolk batter and gently fold together with a spatula. 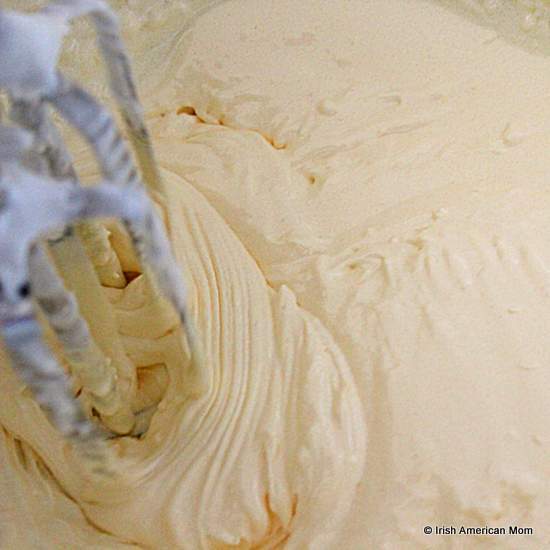 Add two large spoons of the whipped egg whites to the batter, and gently fold them in. 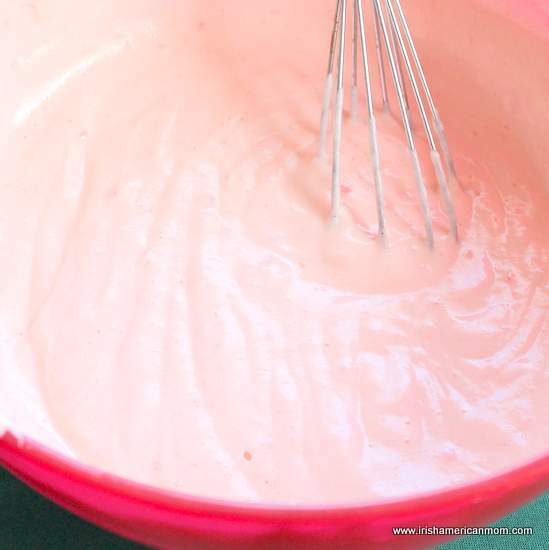 The batter will start to feel looser as you blend it. Fold in the remaining egg whites, gently all the way. You risk beating the air out of the batter if you don’t fold with care. 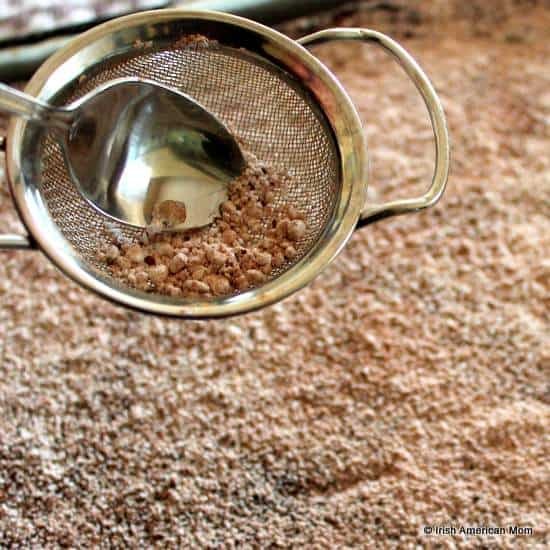 Next sift one tablespoon of cocoa powder into the batter and gently fold it in. 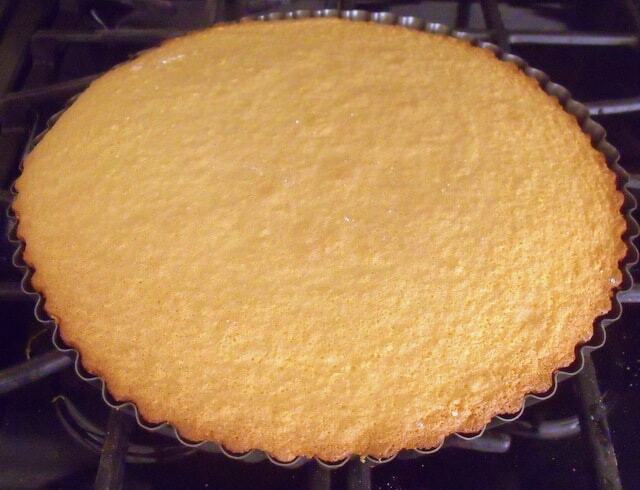 Pour the batter into the prepared baking tray, and gently move the tray around to level out the cake batter. Bake in the pre-heated oven for 20 minutes, until the top is firm to the touch. 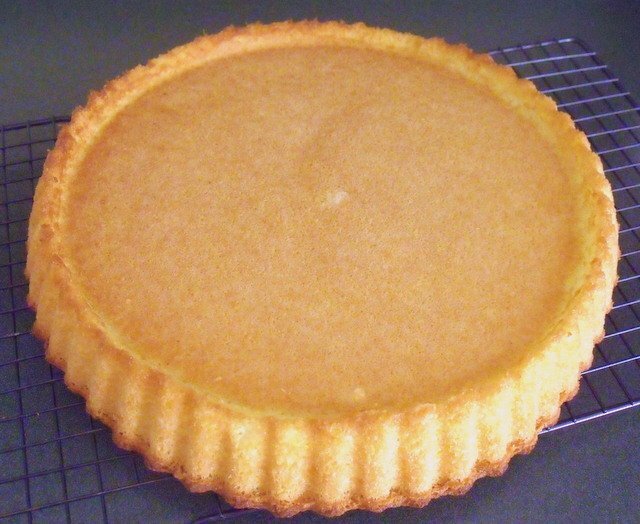 Remove from the oven and allow to cool in the tray on a baking rack so the air can circulate below the tray. Cover the top with a damp, clean dish towel. I spray a little water on the upper surface of the clean towel. This keeps the crust soft as the cake cools. Don’t be surprised if the cake contracts away from the sides of the tray and may even crack a little as it cools. When the cake has cooled completely in the tray, it’s time to get ready for rolling and filling your roulade. If the edge of the cake is stuck to the side of the baking tray, use a knife to separate it from the edge. 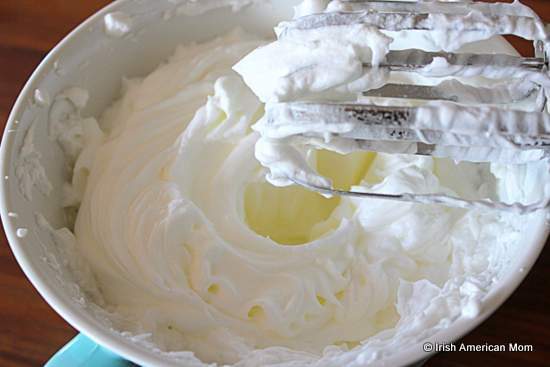 Whip the cream and one tablespoon of confectioner’s sugar until the cream holds its shape. Combine one tablespoon of cocoa powder and confectioner’s sugar and sift it over the top of the cake in the baking tray. Place a large piece of parchment paper on top of the cake. Turn the roulade over and onto the parchment paper. It’s lining paper for baking will now be on top. Make sure one of the narrow edges of the roulade is facing you. 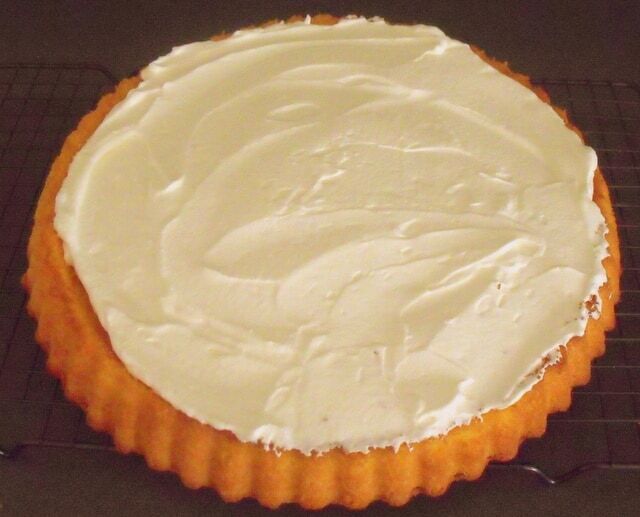 Spread the surface with the whipped cream, leaving the closest 1/2 inch free of cream. Dot the surface with fresh raspberries. Use a knife to make an indentation just inside the edge. I lost a little piece of my roulade along the edge, but after rolling this got hidden on the inside. Phew! Start rolling by turning the cut edge in and away from you. Continue rolling the roulade by using the parchment paper and lifting it up and away from you. A few cracks are sure to happen. You can see the big fault line beneath my baking paper as I rolled my roulade. I don’t think I’ve ever rolled the perfect crack-free roulade. Finish with the joining underneath. 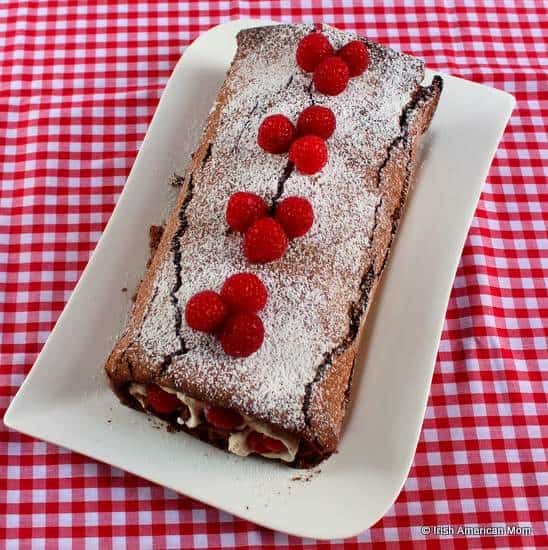 Take great care to lift the roulade onto a serving plate using a large spatula. 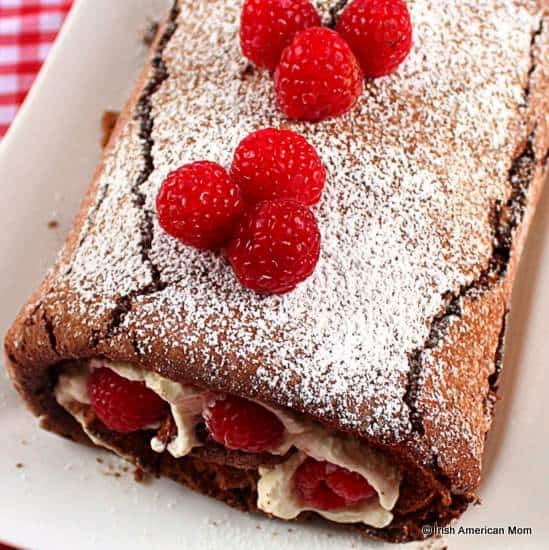 Decorate with more raspberries, confectioner’s sugar and cocoa powder as you wish. 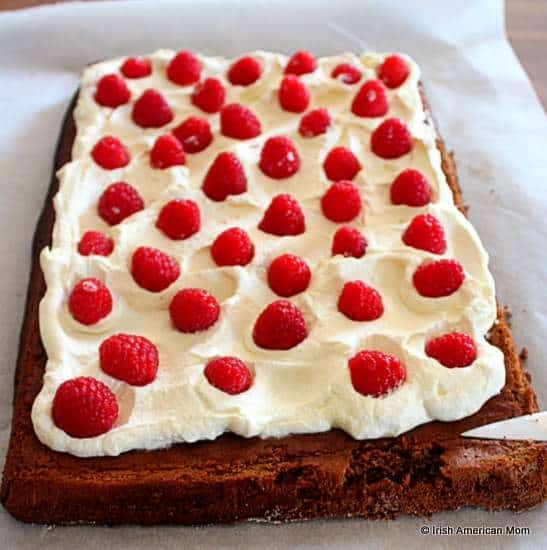 Slice and serve cold with whipped cream and raspberries. Here’s the printable recipe for readers in the United States who measure ingredients using cups. 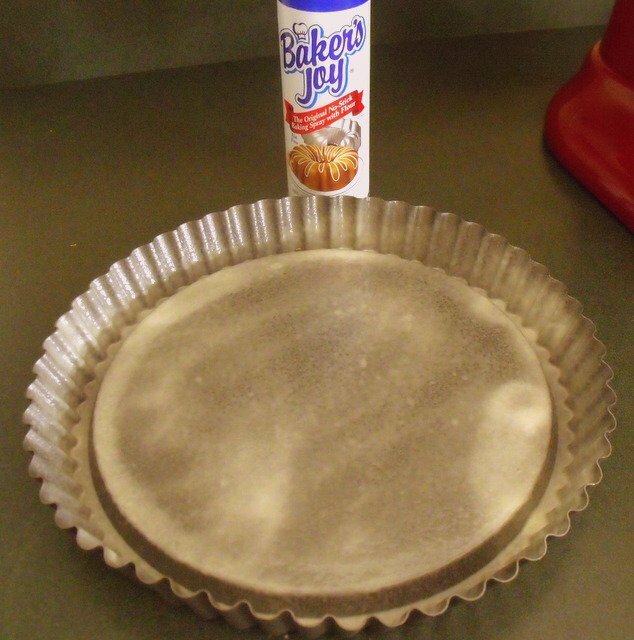 Cover the bottom of a 13 inch by 9 inch baking tray with parchment paper. Add the chocolate chips to a heat proof bowl over a water bath in a saucepan. Simmer over medium heat until melted. Put the chocolate to the side to allow it to cool, but not harden, while you whip the eggs. 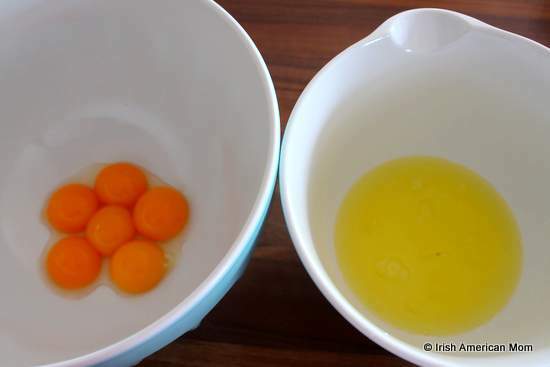 Separate the eggs, putting the six yolks in one bowl, and the whites all together in another large bowl. Beat the egg whites until they are stiff and glossy. 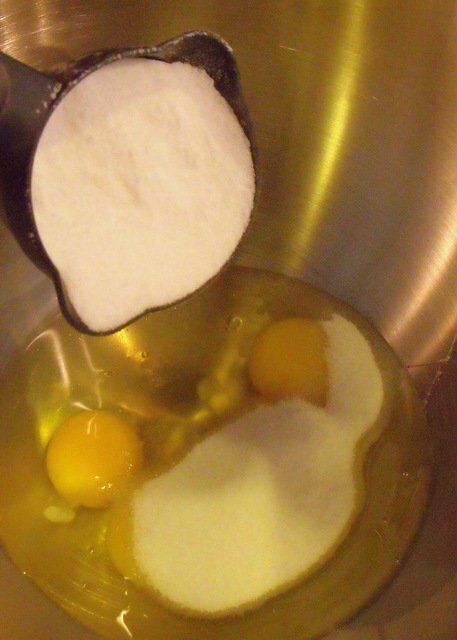 Add the sugar to the egg yolks and beat until they are a pale cream color and the beaters leave a trail through the mixture. 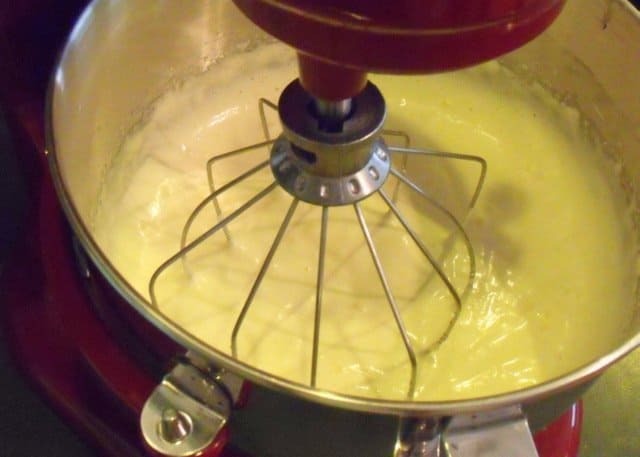 Add two large spoons of the whipped egg whites to the batter, and gently combine together. Fold in the remaining egg whites. 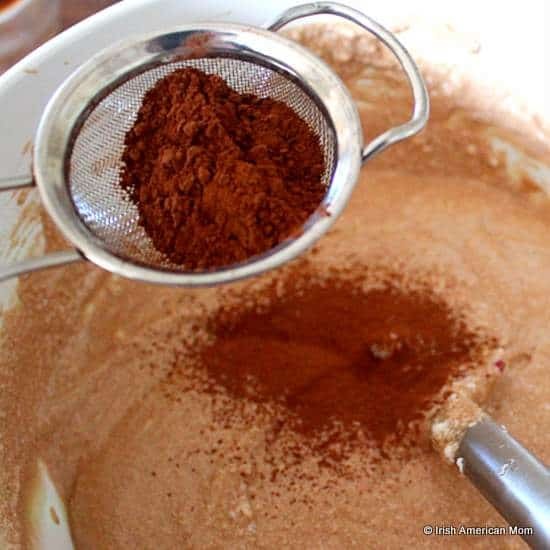 Next sift one tablespoon of cocoa powder over the batter and gently fold in to the batter. 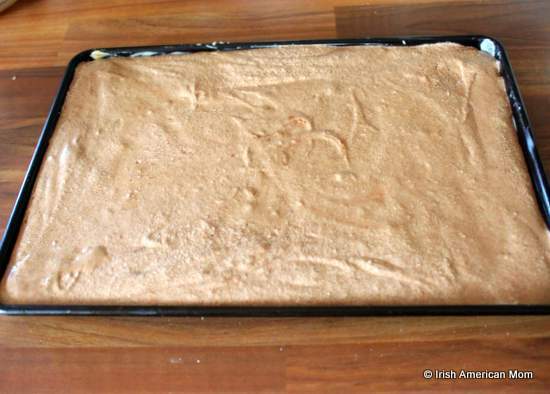 Pour the batter into the prepared baking tray, and gently move the tray around to level. Remove from the oven and allow to cool in the tray on a baking rack. Cover the top with a damp, clean dish towel. When the cake has cooled whip the cream and one tablespoon of confectioner’s sugar until the cream holds its shape. Turn the roulade over and onto the parchment paper. Carefully peel the lining paper away. 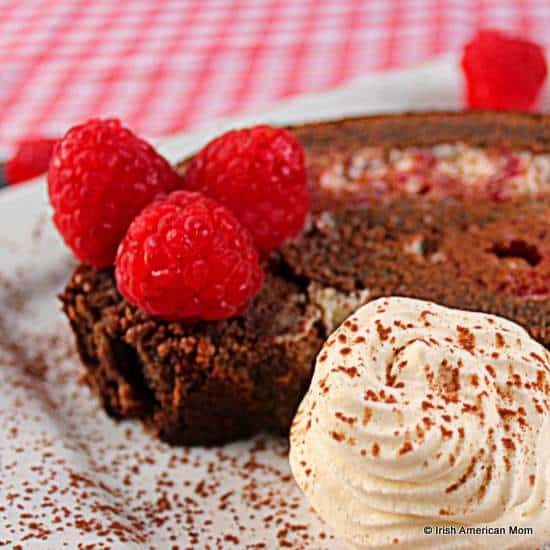 Decorate with more raspberries, confectioner’s sugar and cocoa powder, and serve cold. 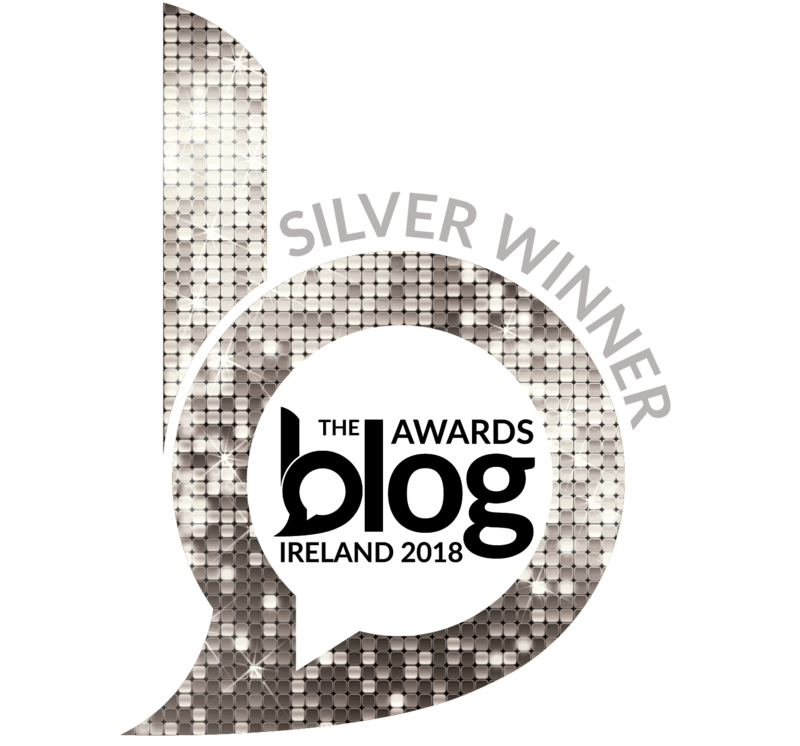 For readers in Ireland, Europe and the United Kingdom, here’s the printable recipe using metric and imperial measurements. 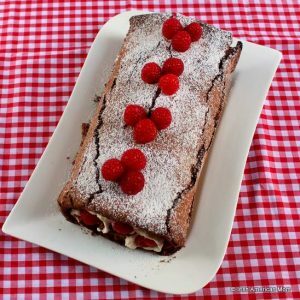 Raspberry and cream chocolate roulade is a gluten-free, light and airy chocolate sponge, and a perfect dinner party dessert. Step 1 Pre-heat the oven to 350° Fahrenheit. 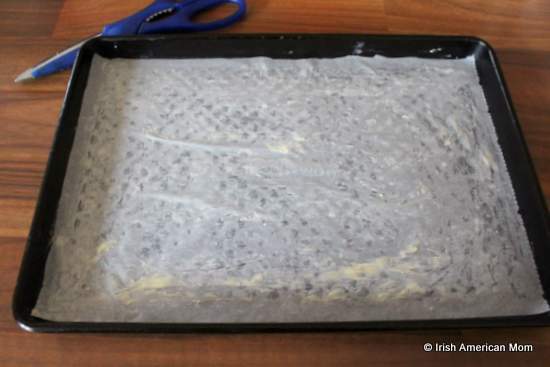 Cover the bottom of a 13 inch by 9 inch (33 cm x 23 cm) baking tray with parchment paper. Step 2 Add the chocolate chips to a heat proof bowl over a water bath in a saucepan. Simmer over medium heat until melted. Put the chocolate to the side to allow cool, but not harden, while you whip the eggs. Step 3 Separate the eggs, putting the six yolks in one bowl, and the whites in another large bowl. Step 4 Beat the egg whites until they are stiff and glossy. Step 5 Add the sugar to the egg yolks and beat until they are a pale cream color and the beaters leave a trail through the mixture. Step 6 Add the cooled, melted chocolate to the egg yolk batter and gently fold together with a spatula. 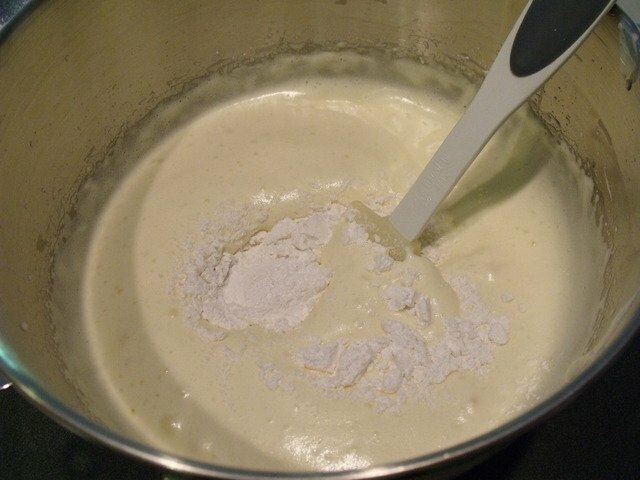 Step 7 Add two large spoons of the whipped egg whites to the batter, and gently combine together. Fold in the remaining egg whites. Step 8 Next sift one tablespoon of cocoa powder over the batter and gently fold into the batter. Step 9 Pour the batter into the prepared baking tray, and gently move the tray around to level. Step 10 Bake in the pre-heated oven for 20 minutes, until the top is firm to the touch. Step 11 Remove from the oven and allow to cool in the tray on a baking rack. 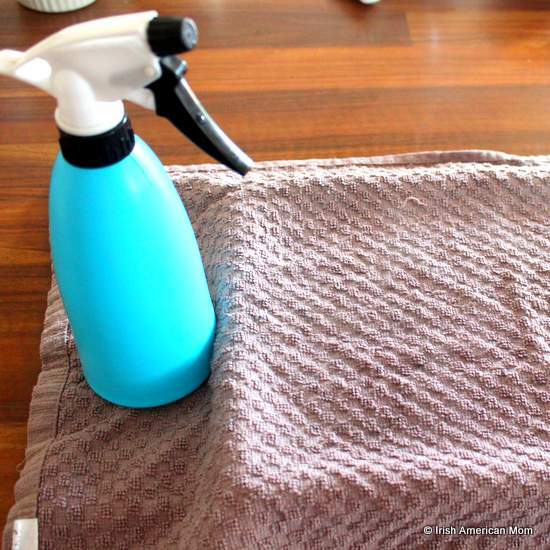 Cover the top with a damp, clean dish towel. If the edge of the cake is stuck to the side of the baking tray, use a knife to separate it from the edge. Step 12 When the cake has cooled whip the cream and one tablespoon of confectioner’s sugar until the cream holds its shape. Step 13 Combine one tablespoon of cocoa powder and confectioner’s sugar and sift it over the top of the cake in the baking tray. Place a large piece of parchment paper on top of the cake. Turn the roulade over and onto the parchment paper. Carefully peel the lining paper away. Make sure one of the narrow edges of the roulade is facing you. Step 14 Spread the surface with the whipped cream, leaving the closest 1/2 inch free of cream. Dot the surface with fresh raspberries. Step 15 Use a knife to make an indentation just inside the edge. Start rolling by turning the cut edge in and away from you. 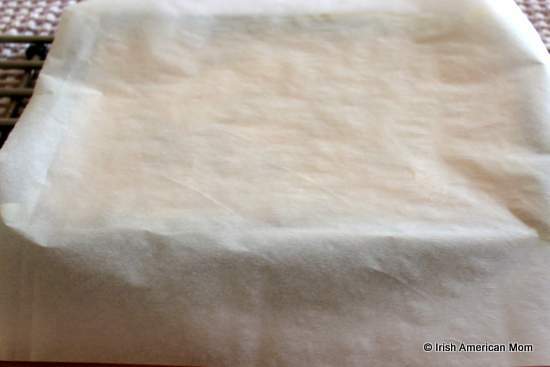 Continue rolling the roulade by using the parchment paper and lifting it up and away from you. Finish with the joining underneath. Take great care to lift the roulade onto a serving plate using a large spatula. 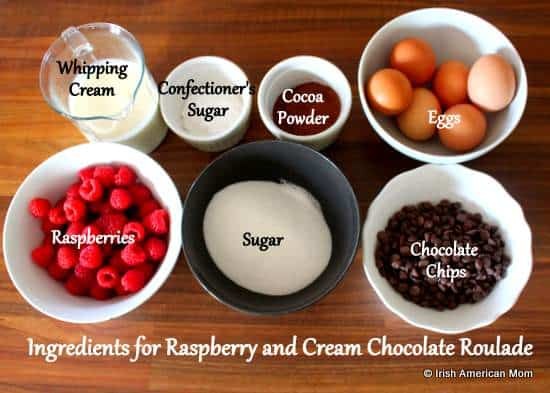 Step 16 Decorate with more raspberries, confectioner’s sugar and cocoa powder, and serve cold. For all you chocolate lover’s out there this is a wonderful treat – it’s rich in cocoa but flour free. Wishing everyone in the United States a very happy Mother’s Day this Sunday. Summertime is berry time, and strawberries are some of my favorite summer berries. 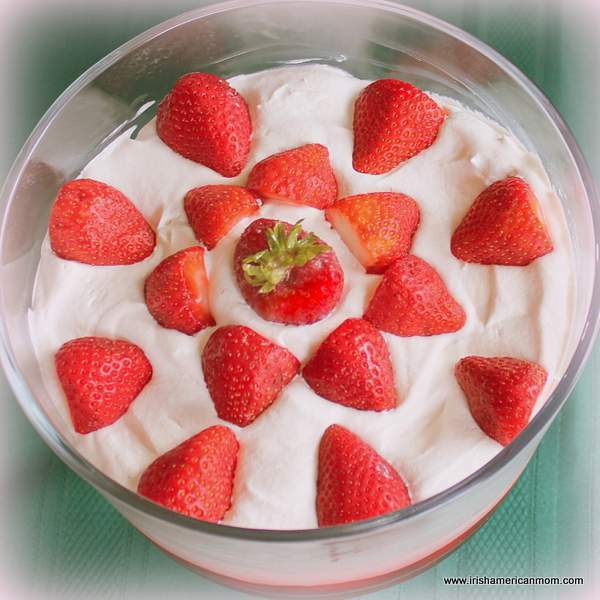 I love to whip up this delicious, easy strawberry mousse dessert for a summer treat. No bake desserts are best for hot summer days and this one is cool, and refreshing served straight from the refrigerator. No cooking, no baking, only cleaning up. Oh, and you do have to boil some water to make the jello or jelly or gelatine (whatever you call the wiggly, jiggly stuff). Luckily, I’m an expert at putting the kettle on, being an Irish tea drinker. Now, this strawberry gelatine dessert with a mousse and cream layer is definitely not one from my Irish mother’s recipe collection. This is a recipe I learned from my aunt, who moved to the United States from Ireland in the 1940’s. 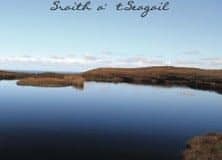 I visited her from Ireland long, long ago, in 1986, before I ever finished college in Ireland, and one of the recipes I remember from that summer is this smooth and delicious layered strawberry trifle. 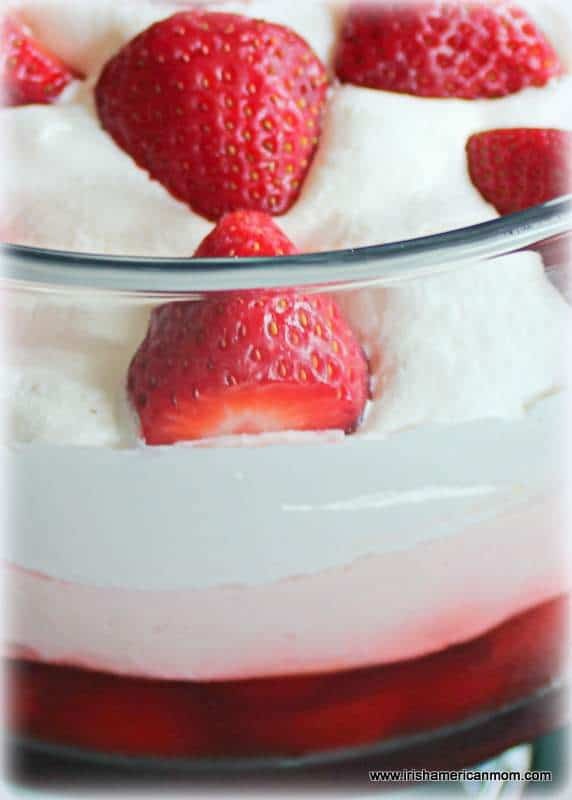 2 x 10 ounce tubs of frozen whipped cream topping (Truwhip or Coolwhip). 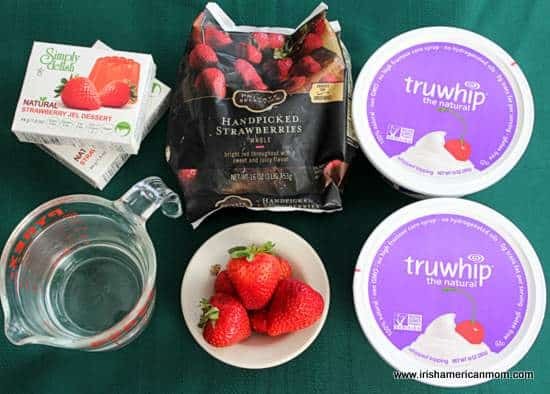 Halve the frozen strawberries and place them in the bottom of a large trifle bowl. Cutting the strawberries isn’t absolutely necessary, but little ones find it difficult to eat if the strawberries are too big. Fresh strawberries work just fine too, but the great advantage with frozen strawberries is that the gelatine sets really quickly. Make one packet of strawberry gelatine, using 1/4 cup less boiling water than the package directs. This is a little trick I discovered over years of making this trifle. Frozen strawberries add extra liquid to the gelatine layer, and when you use the full amount of water this layer can get a little too jiggly. 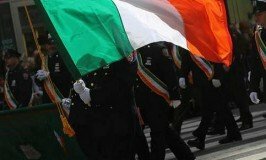 For nicely set jelly (as we say in Ireland) or jello (as we say in America), simply use a little less boiling water. You can use any brand of gelatine dessert you wish. Jello works wonderfully. I choose a mix with no Red 40 food dye, since one of my kiddos is very sensitive to food colorings. Pour the gelatine over the strawberries in the bowl. Place the bowl in the fridge and allow this layer to set. Thaw the frozen whipped cream in the refrigerator according to the directions on the packet. Next make up the second strawberry gelatine dessert packet with the amount of boiling water called for on the package. Let it stand for about 30 minutes to cool. Do not let it completely set to form a gel. You should still be able to pour it. Now it’s time to make the easiest ever strawberry mousse layer. In a mixing bowl, simply combine the room temperature gelatine with one of the tubs of frozen cream topping. Spread the mousse layer on top of the strawberry and gelatine layer. Let it set in the refrigerator for 30 minutes. 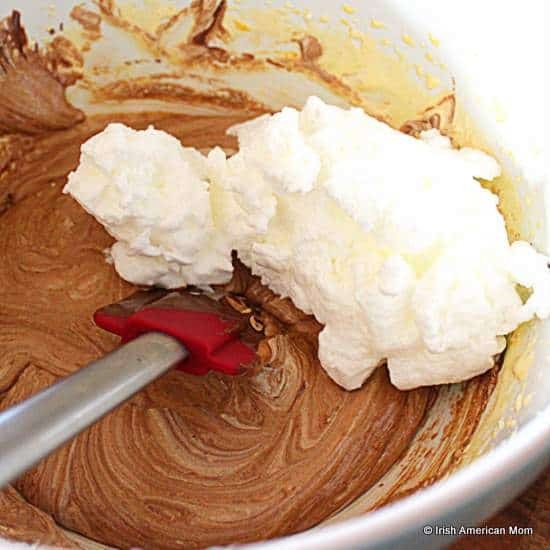 Then, simply add the last tub of whipped cream topping over the mousse. 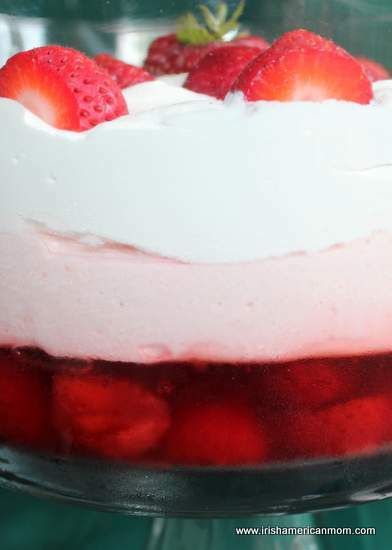 Voilà, you have a lovely layered summer strawberry trifle. 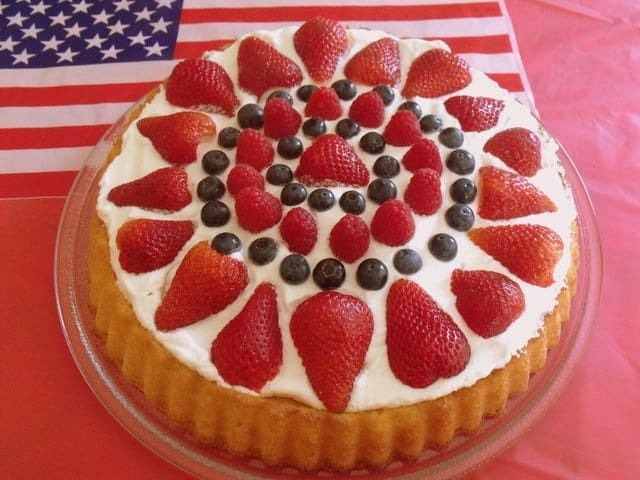 Use hulled and sliced fresh strawberries to decorate the top. This dessert will steal the show at any potluck, or even at a fancy dinner. No need to confess you really only had to boil the kettle to pull this one off. I make a raspberry version of this dessert too. Simply substitute raspberry gelatine, and frozen raspberries for the strawberries, and you have a true crowd pleasing treat. In fact the sky’s the limit. 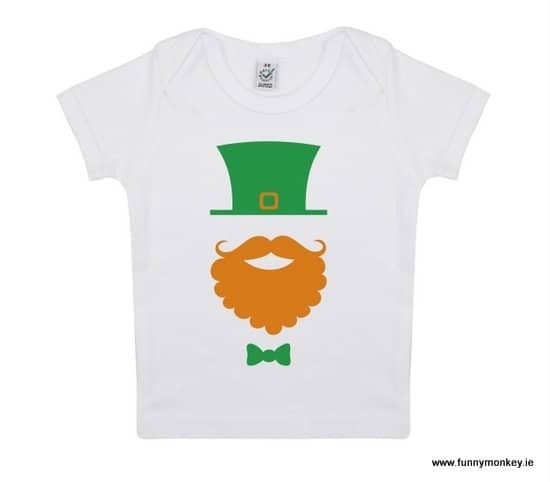 I wonder how it would look in green, white and orange layers for St. Patrick’s Day. 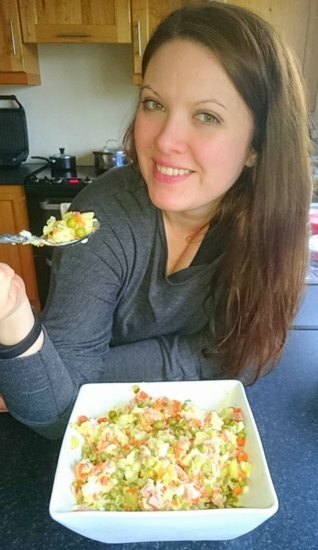 I may have to do some recipe testing ….. 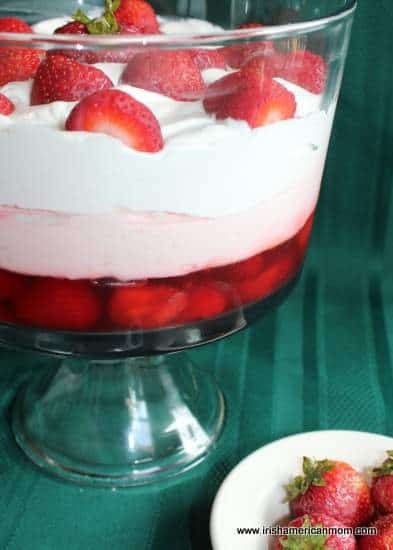 Anyway, I hope you all enjoy this strawberry trifle – it may not be Irish, but it was a firm favorite with my Irish American aunt, and one that brings back lovely memories of a glorious American summer in the 1980’s. It’s hard to believe the desserts of my childhood and teenage years are now considered vintage recipes. As a child of the 60’s, I still love these quick and easy, throw-it-together-in-double-quick-time dishes from the 70’s and 80’s. And not only were they simple to make, they tasted delicious too. Wishing everyone happy summer days, full of cool treats and sweets. 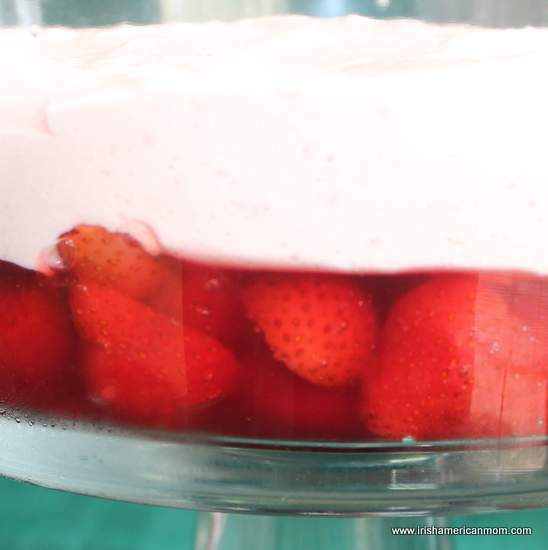 Easy strawberry gelatine dessert with a mousse and cream layer. 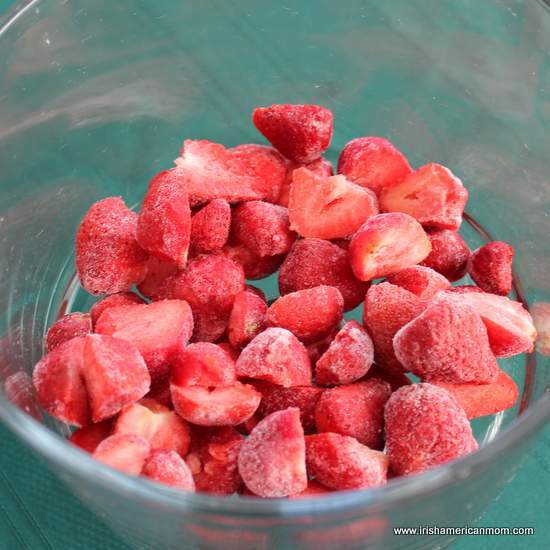 Halve the frozen strawberries and place them in the bottom of a large trifle bowl. 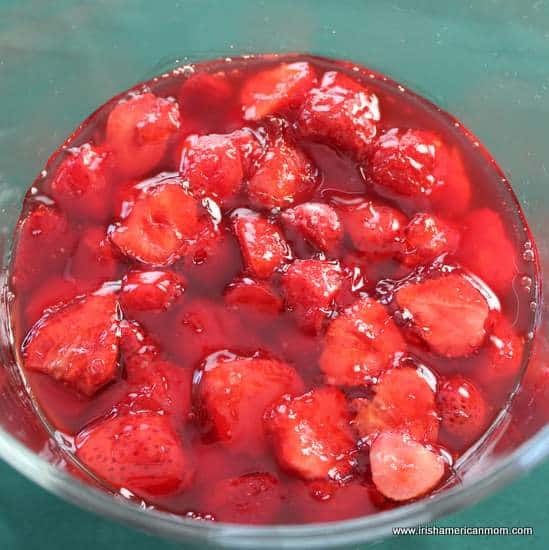 Make one packet of the strawberry gelatine, using 1/4 cup less boiling water than the package directs. Pour the gelatine over the frozen strawberries in the bowl. Place the bowl in the fridge and allow this layer to set (30 to 45 minutes). Thaw the frozen whipped cream in the refrigerator according to the package directions. 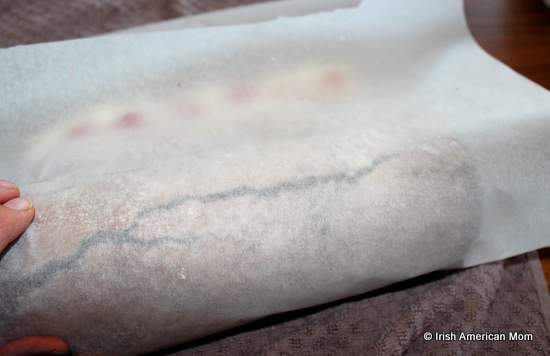 Make up the second strawberry gelatine dessert packet with the amount of boiling water called for on the package. Let it stand for about 30 minutes to cool. Combine the cooled but pourable gelatine with one of the tubs of frozen cream topping. Spread the mousse layer on top of the strawberry and gelatine layer. Let it set in the refrigerator for 30 minutes. Spread the last tub of whipped cream topping over the mousse layer. 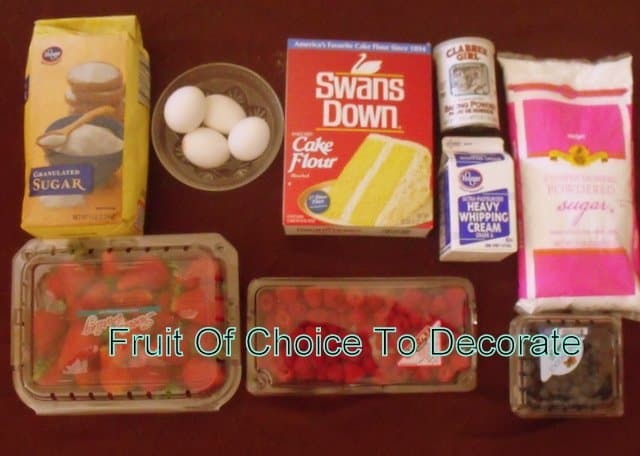 Decorate with fresh strawberries. Chill for at least 30 minutes before serving.